How can we as citizens use technology to contribute to the public good? That’s a key question fueling the research of UC Santa Cruz associate professor of film and digital media Warren Sack. Sack has just been appointed associate director of a new “Data and Democracy” initiative established by CITRIS—the Center for Information Technology Research in the Interest of Society—a joint venture of four University of California campuses. CITRIS was founded in 2000 to help UC researchers create and apply technology solutions to the major challenges faced by California and the world—ranging from climate change to communications. Sack will embark on the new cross-campus Data and Democracy initiative with two UC Berkeley professors—professor of new media Ken Goldberg, who will lead the project, and art professor Greg Niemeyer, who has also been named associate director. The goal of the initiative is to influence communications technologies such as social media to provide ways for people to become personally involved in critical issues that affect their government and community. To do this, the Data and Democracy Initiative will collaborate with partners such as the UC Santa Cruz Center for Games and Playable Media and UC Berkeley’s Center for New Media, along with various other research centers, government, and non-profit organizations. 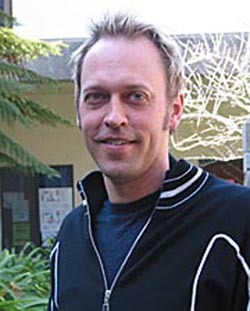 A software designer and media theorist, Sack is also chair of the UC Santa Cruz Digital Art and New Media (DANM) graduate program. His work explores theories and designs for online public space and public discussion. Examples of projects under the Data and Democracy initiative include Metavid, an archive of legislative video from both houses of the U.S. Congress—created in 2006 by two UCSC grad students. It blends video with a wiki format, allowing users to improve the Congressional archive’s accuracy by correcting transcripts and annotating speeches. Another project is Peer to PCAST (President’s Council of Advisors on Science and Technology)—a site that enables peer review of expert scientific testimony within government proceedings. Sack noted that the goal of the new Data and Democracy Initiative lies in the basic question: Can we affect the way business is done by government and local communities on the web?